I really debated on whether this was a 3 or 4 star book for me. The book is well-written and engrossing, and the world Fonda Lee has created is fleshed out so well. I loved the story. But I really struggled in that I just didn’t really connect with, invest in, or love any of the main characters as much as I would have hoped. I liked Shae and Wen, but still not enough to really love this book as much as I might have. I just can’t figure out what is causing that disconnect, and ultimately decided it shouldn’t take away from what ultimately is a great story, and I do look forward to seeing what happens to the Kaul family next. 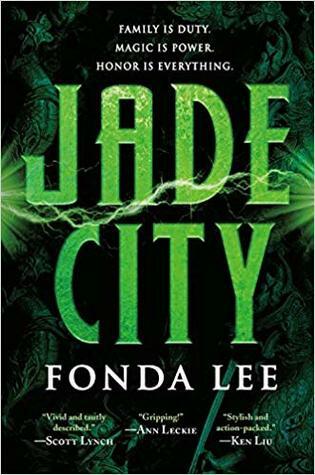 Sign into Goodreads to see if any of your friends have read Jade City. 53.39% "I have mixed feelings about this so far. On one hand, I'm completely engrossed in the story and don't want to book the book down, but on the other I don't really feel invested in any of the characters which is affecting my overall enjoyment of the novel."